As J.R.R. Tolkien once wrote: "Not all those who wander are lost." 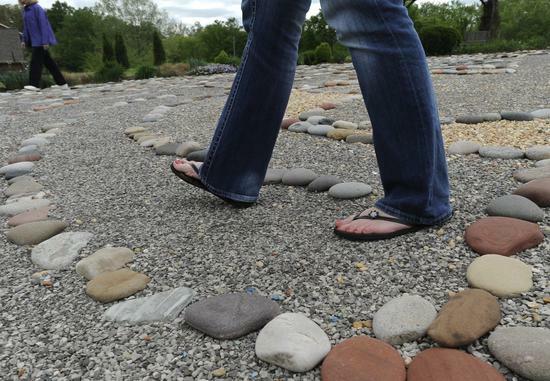 Some, however, might be searching for spiritual enlightenment -- especially those wandering the outdoor labyrinth at Abbey Road Christian Church in Cape Girardeau. On Saturday, Abbey Road will host a World Labyrinth Day event. "It is a tool to use on your spiritual journey," church member Anne McDonough said. "[A labyrinth] can be used as a walking meditation or a prayer walk. It can be used to gain insight into a problem you may be having or just insight into your journey. It helps you open up to spirit and let go." Anne McDonough, left, Jill Sturm, Melanie Sherinski and Rodger Kiepe walk the labyrinth Wednesday, April 30, 2014 at Abbey Road Christian Church in Cape Girardeau. Participants around the world will walk labyrinths at 1 p.m. in their own time zones, McDonough said, with the goal of creating "a wave of peaceful energy for our planet and its inhabitants." McDonough helps maintain the church's labyrinth, which is patterned after one at Chartres Cathedral in France. For McDonough, the labyrinth is a valuable spiritual tool. "It's like walking -- it helps me open up and allow God's presence to become better known," she said. "... Any time you can do that, it just helps in your daily life." Volunteers from the church worked on the 11-circuit labyrinth for at least two years, McDonough said, dedicating the finished project in October 2006. "It was rather intricate to build," she said. The church's evangelism committee used the labyrinth as a project to attract visitors and reach out to the community, McDonough said. "It's open to the community 24/7," she said. "From the very start, we wanted it to be something for the community. It wasn't just for our church." Monks designed the Chartres Cathedral labyrinth as a symbolic means of continuing a pilgrimage they had begun but were unable to finish, McDonough said. Labyrinths differ from mazes in that they have only one way in and out, with no wrong turns or dead ends to confuse or impede walkers. "It drives me nuts when people call it a maze," McDonough said. She said the project's organizers visited other labyrinths, including one at Gaia House in Carbondale, Ill., as part of their research. That labyrinth is one of two in Jackson County, Ill., both designed by retired Southern Illinois University professor Bob Swenson, and both based on the Chartres labyrinth. The other is at St. Joseph Memorial Hospital in Murphysboro. The Gaia House labyrinth is painted on a concrete slab that once supported a geodesic dome, Swenson said. "At some point, the decision was made to use the ... floor slab from a Bucky Fuller dome," he said. A committee formed to put a labyrinth on the slab in time for the turn of the millennium, Swenson said. The group managed to get a temporary labyrinth in place in time for New Year's Eve in 1999. Swenson, an architect who studied with Fuller, later designed a permanent labyrinth for the location. He modified the Chartres design to work within Fuller's geometry -- a 10-sided figure with five short and five long facets -- and reduced the number of circuits from 11 to five to fit the space, he said. A committee member donated money to add a waterfall near the labyrinth and convert the area to a garden, now called the Labyrinth Peace Garden, Swenson said. "The idea is that it belongs to the community," he said. Workers set the stone for the waterfall on the morning of Sept. 11, 2001, Swenson said. "We didn't realize what was happening because of the noise of the tractors," he said. " ... That night, the labyrinth was covered with candles." Like the labyrinth at Gaia House, Abbey Road's labyrinth has provided comfort in the wake of tragedy, McDonough said. "We walked for the children in Connecticut ... at Newtown. Had a special walk for that," she said, referring to the December 2012 shooting that killed 26 people, including 20 children. People of many faiths use labyrinths to enhance their spiritual practice, McDonough said. "The walk in is a letting go of your daily life and the thoughts that go with that, and the center is where you focus and find your guidance or the insights that come to you, perhaps for a question you had or perhaps just walking in and letting go and seeing what happens," she said. "And walking out is where you allow those thoughts and guidance to solidify into you and become a part of you." The earliest known labyrinth, a rock carving in Sardinia, dates to 2500 B.C., according to a brochure from Abbey Road. Labyrinths also appear in Greek, Jewish, American Indian and other cultures. "I'm a big believer in our energies," McDonough said. "Our words have energy, and our thoughts have energy. We have prayer. That's a thought energy." 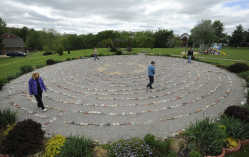 World Labyrinth Day participants hope that by focusing their energy on peace, they can help counter some of the destruction and violence in the world, McDonough said. "This is creating a peaceful energy around the world, which we hope will help increase the peace of the world," she said.